Ryuu Jinja 龍神社 Ryu Jinja "Dragon Shrine"
There are various shrines in Japan with this name.
. . . CLICK here for more 龍神社 Photos !
. Ryuuguu jinja 龍宮神社 Ryugu Jinja - Dragon Palace . Ryuujoo jinja 龍城神社 Ryujo Jinja "Dragon Castle"
Ryuuoo jinja 竜王神社 Ryuo Jinja "Dragon King"
. Ryuuoo 竜王 Ryuo "Dragon King" . Ryuuketsu 竜穴 Ryuketsu is lit. a "hole for the water deity". (Myokichijo Ryuketsu, Mochihokichijo Ryuketsu, and Sasharaebisukichijo Ryuketsu).
. Three Dragon Kings at Ryuketsu Jinja .
. Seiryuu Jinja 青龍神社 Seiryu Azure Dragon Shrines .
. Eight Dragon Shrines . in Japan's Inland Sea was believed to be the abode of the sea-god Ryūjin's daughter. According to the Gukanshō and The Tale of Heike (Heinrich 1997:74-75), the sea-dragon empowered Emperor Antoku to ascend the throne because his father Taira no Kiyomori offered prayers at Itsukushima and declared it his ancestral shrine. When Antoku drowned himself after being defeated in the 1185 Battle of Dan-no-ura, he lost the imperial Kusanagi sword (which legendarily came from the tail of the Yamata no Orochi (dragon) back into the sea. In another version, divers found the sword, and it is said to be preserved at Atsuta Shrine. The great earthquake of 1185 was attributed to vengeful Heike spirits, specifically the dragon powers of Antoku. 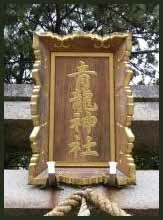 Ryūjin shinkō ryuujin shinkoo 竜神信仰 "dragon god faith" is a form of Shinto religious belief that worships dragons as water kami. It is connected with agricultural rituals, rain prayers, and the success of fisherman. Ryūjin ("dragon kami") faith is a form of religious thought and practice associated with dragons, a mythical sacred animal of ancient China. 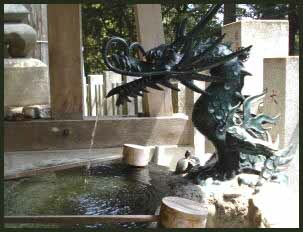 Although Japanese ryūjin worship was influenced by China, the Japanese dragon as an object of faith was a deified snake, a symbol of a water kami (suijin). 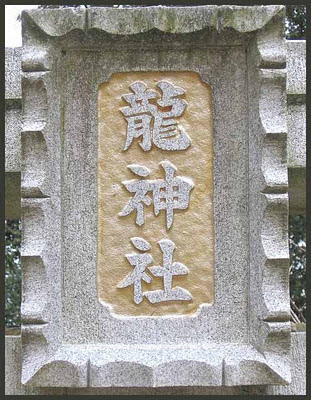 Besides the term ryūjin, ryūō ("dragon king") and ryūgū ("dragon palace") are also used. The dragon kami is connected with agriculture because of its characteristic as a water kami. 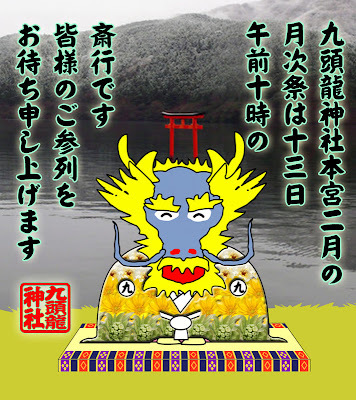 Prayers for rain were performed at rivers, swamps, ponds, and deep pools which were regarded as the abodes of the ryūjin. Agricultural rituals, such as prayers for rain and rope pulls, were carried out using a straw rope shaped like a serpent-like dragon. As a water kami, ryūjin is connected with raijin, the kami of thunder, who brings forth rain and lightning. It is thought that the dragon kami ascends to heaven when a tornado occurs. Further, umi no kami (kami of the sea), thought to reside on the other side of the ocean and to rule over the sea, is connected with water kami belief and is frequently used as a synonym for ryūjin. Fishermen prayed to the dragon kami for an abundant catch and calm seas. They carried out festivals for ryūjin, celebrated as the kami of the sea and the kami of the dragon palace. These festivals are referred to by such names as uramatsuri ("inlet festival"), isomatsuri ("beach festival"), and shiomatsuri ("tide festival"). From the belief that metal nullified the magical powers of a snake, there developed the idea of refraining from actions that would anger the snake. Hence, fishermen believed it was taboo to drop metal in the ocean. This was the background to the idea of the equivalence of the snake kami, the dragon kami, and the sea kami. The motif of interaction between the sea kami and humans often appears in folk tales such as Urashima Tarō and Ryūgū Dōji. The belief that wealth and treasure is brought from the other side of the ocean derives from this source. 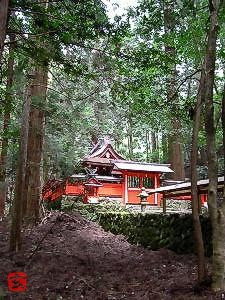 There are many more shrines in Japan which are related to the Dragon, but do not carry its character in the name. 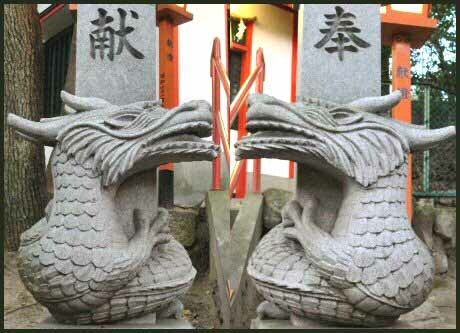 Tatsuo Jinja 瀧尾神社 "Dragon tail shrine"
Kuzuryuu Taisha 九頭竜大社 "Dragon with nine heads"